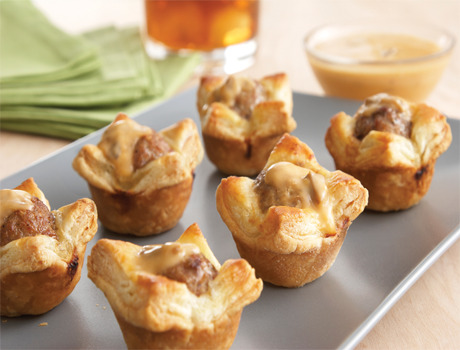 How adorable...these perfect little puff pastry tartlets are filled with a delicious Swedish-style meatball and topped with a flavorful mushroom sauce. Be sure to serve these at your next party! Heat the oven to 375°F. Beat 1 egg and the water in a small bowl with a fork. Thoroughly mix the meatloaf mix, bread crumbs, onion, remaining egg, nutmeg and black pepper in a large bowl. Shape the meat mixture into 24 (1-inch) meatballs. Heat the oil in a 12-inch skillet over medium-high heat. Add the meatballs and cook for 5 minutes, turning the meatballs over once halfway through the cooking time. Drain the meatballs on paper towels. Sprinkle the flour on the work surface. Unfold 1 pastry sheet on the work surface. Roll the pastry sheet into a 10-inch square. Cut the pastry sheet into 12 (about 3 x 2 1/2-inch) rectangles. Repeat with the remaining pastry sheet. Press the pastries into 24 (1 3/4-inch) mini muffin-pan cups. Brush the pastry cups with the egg mixture. 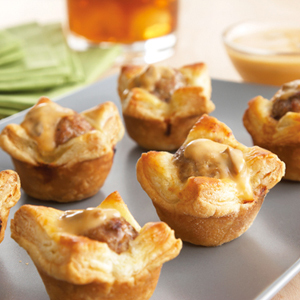 Place 1 meatball into each tartlet shell. Bake for 25 minutes or until the pastries are golden brown. Remove the pastries from the pans and let cool on wire racks for 5 minutes. Heat the soup and milk in a 1-quart saucepan over medium heat until the mixture is hot and bubbling, stirring occasionally. Spoon the soup mixture over the pastries before serving.